An SD card slot allows up to 1TB of expansion, though that slot is shared with a second SIM. Other noteworthy features include 2x2 802.11ac Wi-Fi for better wireless reception, plus Bluetooth 4.0LE and Miracast. The phone also offers NFC, making the Elite x3 compatible with Microsoft’s tap-to-pay Wallet app. There’s a 3.5-mm audio jack, too. Unfortunately, an expensive licensing process overshadows what could be a transformational experience. Workspace is available in two tiers: Essential ($579 per year, per user, or $49 per month) and Premium ($939 per year, per user, or $79 per month). A year of VPN integration costs extra: $2,995 per month. Each account tier comes with 24-hour support during the five-day workweek. Workspace was generally pleasant to use, even if it had its own little quirks. Not surprisingly, HP forces you to use Workspace in conjunction with a dock. HP supplied a login and password, which I had to manually enter each time. Workspace also encourages you to store files in cloud storage services like Box, Dropbox, or OneDrive. But there’s no obvious way to actually access a Word file stored in Box unless you’re in Word. Because it’s virtualized, HP keeps an eye on your usage. Go idle for more than nine minutes, and it logs you out. Windows itself will turn off the screen after five minutes by default, so if you don’t have HP’s own Display Tools configured properly, you’ll have to log in again, then navigate to the Workspace app. And if you happen to close down all the Workspace virtualized apps, there was no obvious way to get back to the main Workspace environment, aside from a small Settings icon. Workspace limits your frame rate to about 15 frames per second—acceptable for static apps like Word or accounting software, but absolutely useless for high-bandwidth applications like video editing or even YouTube. For businesses with numerous Win32 legacy apps (and big IT budgets), it’s worth considering. For them, maintaining access to those apps affects total cost of ownership, which goes beyond just the price of the phone. Small details like this show HP’s pride of workmanship. 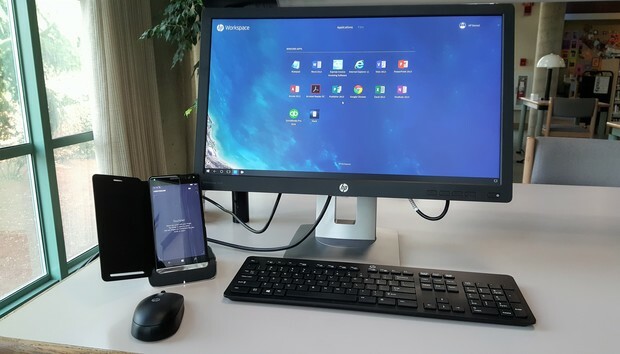 Let’s not forget Windows phone’s distinguishing feature, Continuum. The HP Elite x3 is the best example yet of this phone-to-PC mashup, and it remains a feature that Android and iOS just can’t match. Speculation is flying about what’s next for Windows phone: A Surface phone? Maybe. For now, HP’s Elite x3 is the best Windows phone. Whether it’s the last great Windows phone is the unanswered question.